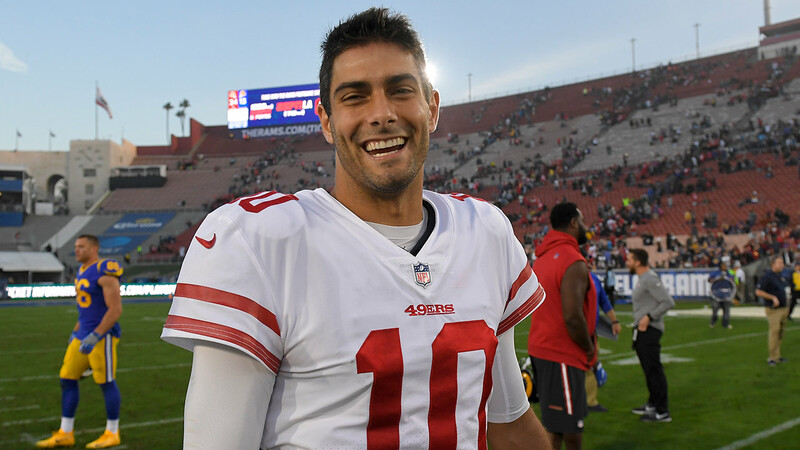 FILE - In this Dec. 31, 2017, file photo, San Francisco 49ers quarterback Jimmy Garoppolo smiles as he walks off the field after a football game in Los Angeles. SANTA CLARA, Calif. (KGO) -- The San Francisco 49ers have had some legendary quarterbacks, but they all have to take a back seat to Jimmy Garoppolo when it comes to money. The team and Garoppolo agreed to a record-breaking contract that will pay him a reported $137.5 million. That breaks down to $27.5 million per season to top the previous record by $500,000 per season. The 49ers traded a 2nd round pick to the Patriots to get Garoppolo in the middle of the 2017 season. He won all 5 games he started for the 49ers. "This is where I want to be. I'm excited we got it done as fast as we did," said Garoppolo. 49ers General Manager John Lynch says he wants the Niners to be a destination franchise, saying they've signed Garoppolo and it's 75 and sunny in Santa Clara. Lynch says the Niners still have plenty of cap room and will be aggressively prudent when it comes to adding more players. "We have one goal in mind. Get to the Super Bowl and win it," said Garoppolo.